Were Political Bots Active in Ontario’s PC Leadership Race? We found out about this Reddit thread through a mention on Twitter. We are both interested in the changing role of digital campaigning. You can read about our work, especially on bots, in the Oxford Internet Institute Report on Global Computational Propaganda. 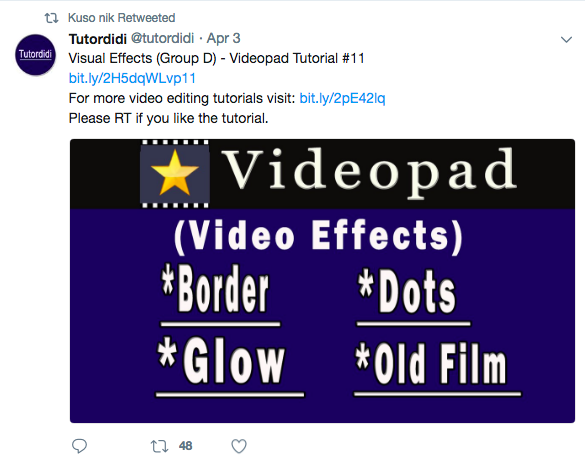 Given the interests of the users in that thread, we thought there might be a public benefit in walking through some of our own methods to investigate social media bots. While this isn’t an exact science, we have learned a few things about what we refer to as social media manipulation, and we hope this post helps to share our knowledge. We believe trolling and bots are cross-partisan issues. Without more evidence, we do not believe that any particular political side is more inclined to use bots or media manipulation than any other in Canada. We’re looking into this matter because it’s the first time someone from the public has asked us to. (We would also like to acknowledge that we could be getting played here too—giving too much attention to a pretty ineffective political tactic—but research is lonely enough as is without total suspicion). Twitter is a marginal social media platform in Canada. Discovering strange campaign practices on Twitter should, we hope, encourage further investigations of more popular platforms, especially Facebook and Instagram. These platforms have been notoriously difficult for scholars to study. Research ethics limit us from investigating beyond these public tweets. We have not and cannot interview anyone at this time. We cannot know for sure who is behind this or why. But we still see value in talking through our Twitter analysis. We can’t guarantee we will be able to respond to every request in the future, but we hope this helps. Now to the research. In reviewing the suspected bots and other data, we found a few suspicious accounts promoting the #crookedchristine hashtag. These accounts, we believe, may have been trying to amplify the hashtag. The tactics were not sophisticated, especially (as we discuss below) because of the low uptake of the #crookedchristine campaign. There were only 488 unique tweets containing the hashtag #crookedchristine (pretty minimal). In fact, #crookedchristine only appears five times in the 19,627 tweet sample of #PCPO or #PCPLdr that we collected from March 2 to 12, 2018. Kremlin-backed foreign interference (we have no evidence of this and think it is unlikely based on past work). So, why do we think this? We can learn a lot through digital methods to study online campaigning. To begin, do we know these accounts are bots? As a first step, we checked the 28 suspected bots using Botometer, a project to detect bots led by the Observatory on Social Media. The results are pretty inconclusive. The average score for our 28 accounts was 0.42 (ranging from 0.2 to 0.64). This score, the English-specific score to be precise, refers to the likelihood that an account is a bot based on a few metrics, such as sentiment and the friend network. None of the accounts have high scores, so we are not confident that these are bot accounts. Botometer requires lots of data to make its judgments, so the accounts’ newness could be a factor. Inconclusive results do not mean that we can’t use other methods to find bots. In fact, Botometer performs particularly poorly with new accounts since there is less data available. We also found this list to be a helpful guide to identifying bots. The username and copied account images are often tells that you’re dealing with a fake Twitter account. In the past, we have also used frequency (more than 50 tweets per day) to find suspicious or bot accounts, but these accounts tweeted so little we did not use that metric. Using these methods, a few accounts look particularly suspicious. We found more than these four, but we are confident there is something strange in these accounts. Research from our colleague John Gray at MentionMapp further confirms our suspicions. He noticed that all these accounts were registered at the same time. These four profiles were created the same day within a few minute of each other, and three had avatar pictures easy to find on the Internet, including the now infamous MikeHockey1234. They are now all deleted too. Did these accounts behave strangely? Using our sample, we extracted the number of tweets that mentioned a few hashtags circulating during the leadership campaign. Though unsuccessful, the accounts here attempted to amplify certain messages, potentially trying to influence what’s trending or popular online. Though we couldn’t track who retweeted who, we did notice some evidence that these accounts retweeted each other. While little more than a guess, we would be surprised if this activity was guided by foreign interference given its lack of sophistication. The Kremlin-backed Internet Research Agency seems to be more adept. It’s much more reminiscent of Pierre Poutine and the robocalling scandal. Regardless of whether these are or are not bots, we suspect these accounts are engaged in what is called media manipulation. The term refers to “the spread of false or misleading information” that influences the news agenda or social media analytics, according to Data + Society. The term has also been called tactical media where “journalists/artists/activists take seriously Marshall McLuhan’s insight that the medium is the message and have turned, instead, to manipulation of information production, processing and delivery seriously,” according to communications policy scholar Sandra Braman. Tactical media and media manipulation can be both good and bad; both are a fact of political campaigning today. We are interested in exposing the tactics of tactical media, because it has become important and influential to today’s new cycle and because, at its worst, media manipulation erodes trust in the political system and public opinion. Our chief concern is that political operatives in Canada would launch or support a campaign like this, especially as we are beginning to understand the adverse effects of political polarization. This media manipulation could amplify political division in what looks to be a very contentious election. As we have called for in the past, we would ask that all parties and candidates in the Ontario election abide by a code of conduct and report the use of social media bots. At the very least, all candidates in the Ontario election should publicly state their relationship to this campaign. In the coming weeks, we’ll be posting a summary of AI policy in Canada. For now, we’re happy to report on a productive meeting about the Treasury Board’s efforts to address the responsible use of AI in government. On November 15, 2017, a group of professors, researchers, and practitioners were pleased to host Michael Karlin from the Treasury Board Secretariat and Tara Denham from Global Affairs Canada to discuss details of the Canadian government’s plans for implementing AI and to cultivate a broader conversation about AI policy in Canada. Karlin’s in-progress white paper “Responsible Artificial Intelligence in the Government of Canada,” part of the Digital Disruption white paper series, served as the prompt for the meeting. Karlin is taking a novel approach to consultation, posting the paper as a Google document for the public to read and edit as well as making several stops across Canada to gather direct feedback about the paper’s recommendations. Only after this consultation will the paper be translated into formal standards for the federal public service. In addition to serving as a guide for implementing AI, Karlin hopes this flexible but productive style of consultation will become more common in Canadian government. We were encouraged by the ease of participating in the Treasury Board Secretariat’s consultation process and their willingness to meet us at the university. Denham’s participation in the process was also welcome. As director of the Democracy Unit at the Office of Human Rights, Freedoms, and Inclusion at Global Affairs Canada, Denham seeks to ensure that Canada incorporates human rights considerations in its approach to AI in government, in the private sector, and in a global context. We remain hopeful that Canada will continue to foster such openness in policy formulation, allowing researchers as well as those affected by policy decisions to play a part in the early stages. While appreciative of the process thus far, our group stressed the importance of committed inclusive consultation. Given the wide-ranging consequences of AI, the voices of indigenous people and union leaders must be sought out and their participation facilitated. Canada is currently experiencing what legal scholar Michael Geist has deemed a “consultation crisis” with cash-strapped public interest groups being asked to somehow contribute to a rapidly expanding number of important regulatory changes. Financial support is essential to ensure that people outside of academia or the corporate world can join these conversations. The CRTC, the more familiar regulatory institution for us, allows participants to charge for some of their expenses; this is a small but welcome acknowledgement that engaging in the policy development process can carry real costs for many participants. Our conversation turned to the paper itself as Karlin walked us through the state of responsible AI at the Treasury Board Secretariat. The report considers a range of specific applications aimed at improving government service delivery, such as chatbots, while also attending to the risks of automation. In that regard, the report should be commended for what it avoids as much as what it includes. Delving further into the complex ramifications of automation, we discussed ways that an automated decision making system could increase efficiency without undermining human oversight. There is a need to understand what Mary L. Gray and Siddharth Suri call “the paradox of automation’s last mile”—the phenomenon where automating something entails hiring humans in difficult, precarious, low-paying jobs to make those decisions that lie beyond automation’s grasp. As the history of women in computing has shown, what counts as routine is often the product of social division and class. These wider concerns haunt any specific application of AI. Focus on assistance rather than automation—aid rather than replace workers. Recognize bias and the sources of training data—address potential harms from the start rather than seek to fix discriminatory outcomes afterward. Ensure explainability and accountability—make sure that AI improves public understanding of governmental processes and decision making. By being a model citizen, the Government of Canada has an opportunity to lead by adopting strong, accountable, and public-minded policy toward AI. Furthermore, we hope this specific conversation about AI policy inspires a much broader discussion of these issues. Register now for the Geothink & Learn 3: Governing Artificial Intelligence webinar on December 7, 12–1:30 p.m. The panel will bring together leading academic experts—including the AMO’s Fenwick McKelvey—to discuss the opportunities, challenges, and implications of the adoption of AI by cities with a focus on the Canadian context. Visit Geothink for more information. Questions about the democratic impact of social media political advertising have recently burst their way onto policy agendas and into public consciousness. 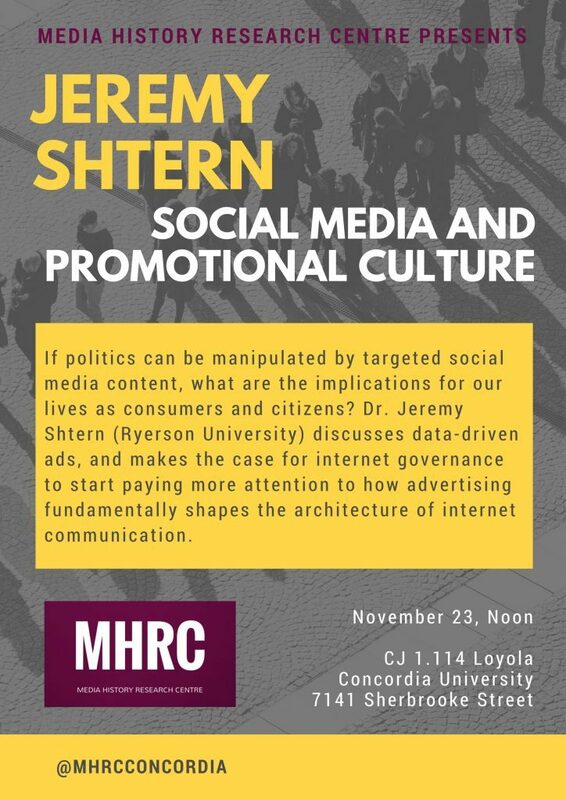 But if politics can be manipulated by targeted social media content, what are the implications for our daily lives as consumers and citizens when brands and advertisers use the affordances of social media to influence our thinking and choices? 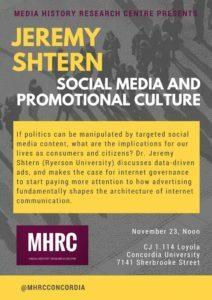 Based on more than four years of research into social media advertising, Jeremy Shtern (Ryerson University) discusses the internet governance implications linked to the emergence of data-driven social media advertising. He makes the case for internet governance discussions to start paying more attention to the fact that advertising—historically a crucial policy agenda for governing electronic communication—is fundamentally shaping user experiences online and sponsoring the architecture of most public internet communication. Laying bare the violent realities behind Canada’s veneer of multiculturalism and tolerance, Policing Black Lives traces four hundred years of state-sanctioned surveillance, criminalization, and punishment of Black life in Canada. 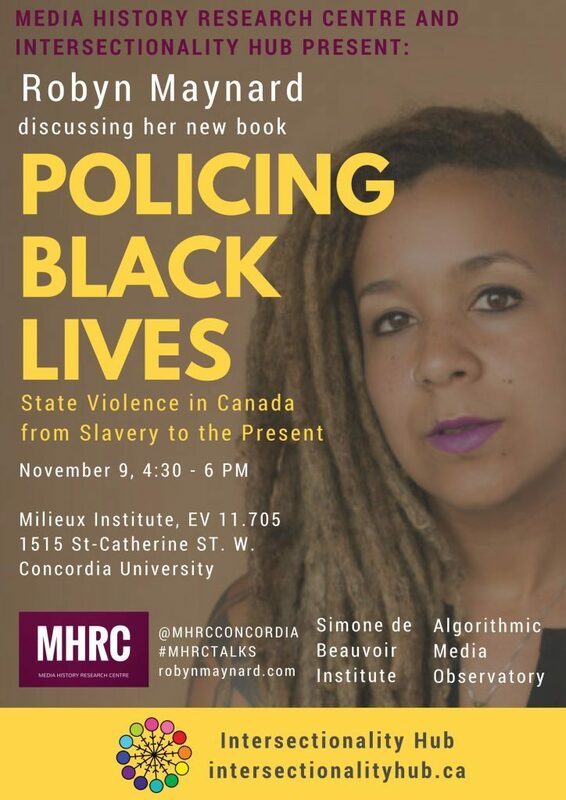 Through an unapologetically intersectional, feminist, and abolitionist lens, this talk looks at how slavery’s legacy has been carried forward by the state, exposing the social and historical forces behind carding/street checks, the war on drugs, the school-to-prison pipeline, welfare “fraud” and child welfare enforcement, deportation, and the disproportionate incarceration of Black folks in Canada’s jails, prisons, and immigration detention centres.